Note: PLEASE click these photos for a larger view. 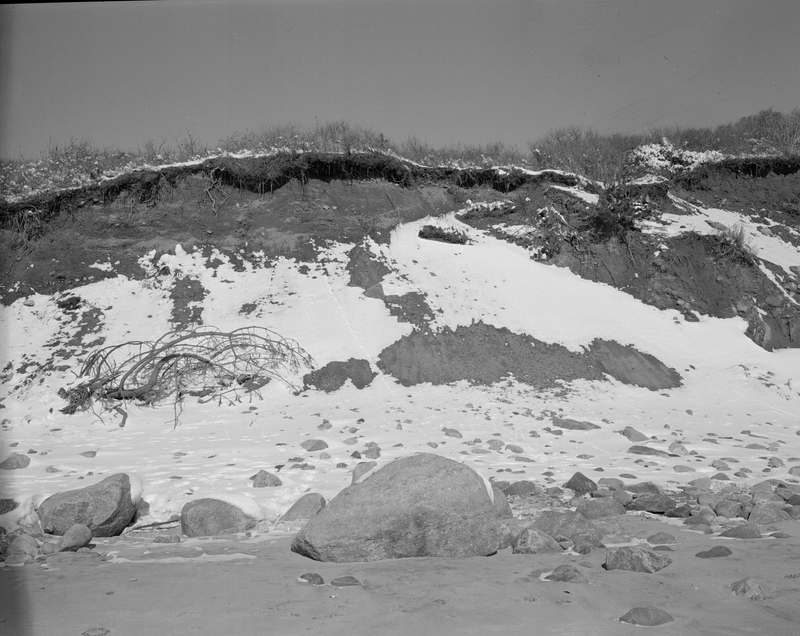 They are all 4×5 negatives scanned at 4800 dpi. Remember when I got all excited about the MOD54, the insert that allows you to easily develop 4×5 sheet film in a Paterson tank? It seems like the distant past, considering how little 4×5 film I’ve shot since then. 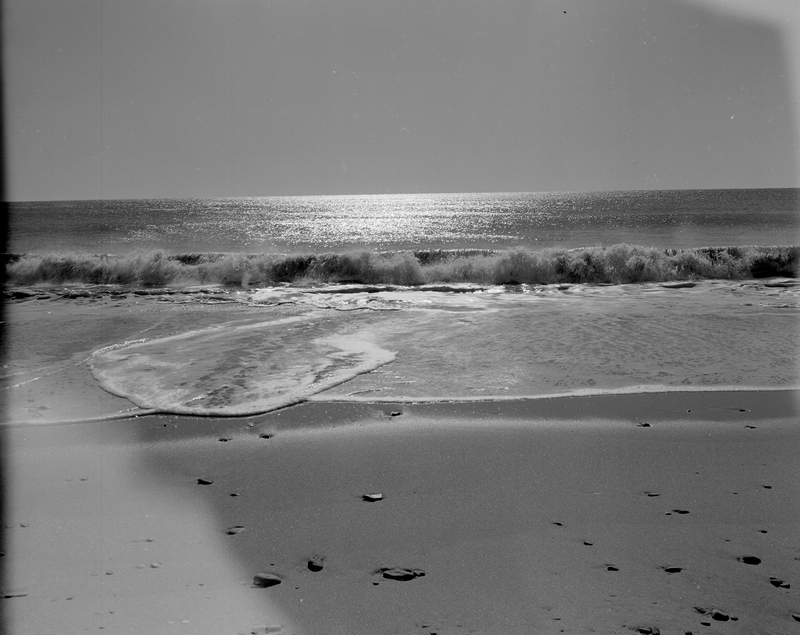 We were invited for a long weekend in Montauk (a little paradise at the very eastern end of Long Island), so I took the opportunity to pack up a Crown Graphic and a selection of sheet film. The whole kit included a Manfrotto tripod with spikes, a Grafmatic and 4-5 sheet film holders, 320TXP, Adox Ortho 25, and Porta 400. On Monday morning (Presidents’ Day and Washington’s Birthday here in the United States), we headed down to the beach with the camera and the dogs. 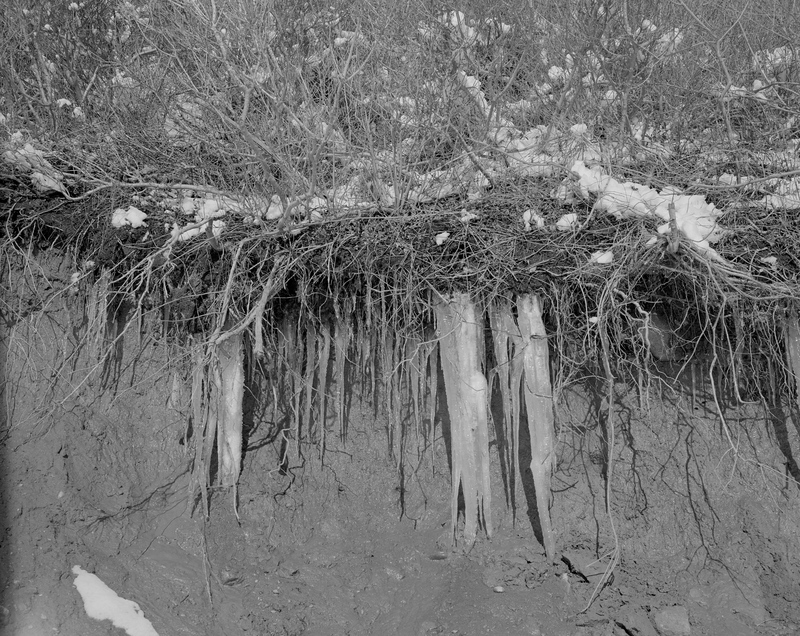 Having loaded the Grafmatic with ortho film, and film holders with Tri-X, I started shooting the icicles and other weather-related scenery on the beach. Behind me, the Atlantic Ocean pounded relentlessly, the dogs splashing around in the sub-freezing froth. I didn’t even meter the scene—the sun was bright, so I used the sunny 16 rule and worked backward from 1/25 at f/16. Except I was so mesmerized by the scenery and chilled by the 19F temperature that I did actually work backward—I figured 1/100 at f/32 instead of 1/5. I realized it after I spent the Grafmatic and started on the 320 speed Tri-X and calculated the same exposure. At that point the Crown Graphic started acting up as well, with the shutter tripping when I cocked it, leading to at least one double (triple? quadruple?) exposure. Shutter intrusion? Montauk. Kodak Tri-X (320TXP) 4×5 developed in Atomal 47; Crown Graphic, 127mm Optar. 1/100, f/32. Click photo for larger version. I developed the sheets that same night and the results were mixed at best. First, I’m too cavalier with sheet film, as I saw my fingerprints on the sheets from loading the film. Just because your fingers are dry as a bone in the desert sun doesn’t mean they don’t have oil in them, apparently. I also found tons of dust in the negatives as well, despite cleaning the holders and Grafmatic septums carefully and storing them in a Ziploc bag. The scans are easy enough (though time-consuming) to clean up in Photoshop, but I need to clean up my act (pun intended). Finally, the light leaks are annoying. I’m going to have to do some experimentation to find the culprit, but I suspect it’s the Graflex back on the camera itself. Wintery beach, Montauk. Kodak Tri-X (320TXP) 4×5 developed in Atomal 47; Crown Graphic, 127mm Optar. 1/100, f/32. Click photo for larger version. Case in point about my handling of the film: click the photo above for the larger view (you may have to click it a second time to get the full size), then scroll to the upper right corner. The scratches are terrible! I’ll post about the Adox Ortho 25 on a later date, but thought I’d share the Tri-X 4×5 today. I do like it in the Atomal 49; I’ll have to try some other subjects to see if it’s differentiated enough to use regularly.